If you’ve ever been locked out of your house or car, you surely recall the sinking feeling in your stomach once you accepted the fact that you did indeed misplace your keys. The realization is accompanied by feelings of vulnerability and frustration. But trust us: as bad as you feel now, as soon as you get back in, you’ll want to prevent this from ever happening again. Enter the KeyMe locksmith in a box. KeyMe allows you to save digital copies of your keys in case you ever get locked out. Visit a kiosk and try it today. 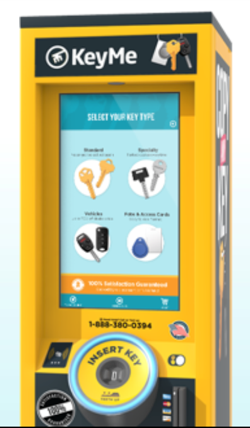 In doing this, your keys will be saved so you can easily access and replace them at any kiosk location in the event of an emergency. 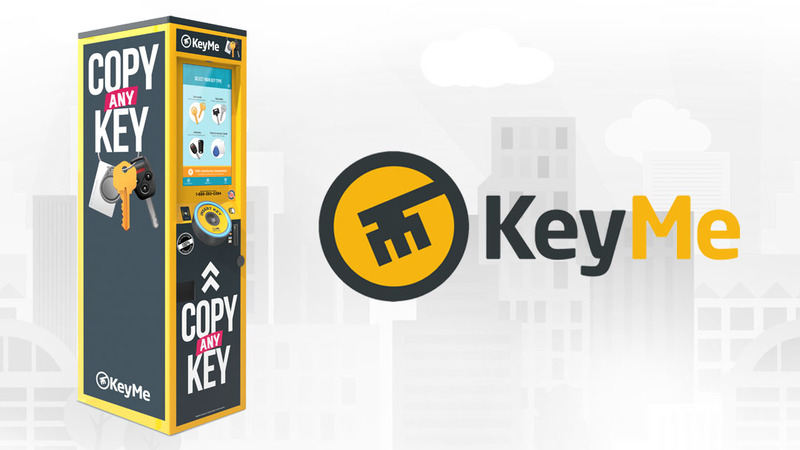 To order a replacement key, all you need to do is visit the nearest KeyMe kiosk and cut a copy of the key you’ve previously saved within the app. Better yet, if you have saved a payment method using the app, you can save your fingerprint at the kiosk. This ensures that, even if you are locked out without your wallet, your finger can become your payment method! So how do you save a key to the KeyMe app? If you are looking to save a simple house key, or something more complex like a car key or high-security key, you can scan your keys at a KeyMe kiosk. You can find our kiosks inside many popular retailers, such as RiteAid, Bed Bath and Beyond, 7-Eleven, or your local grocery store. To save a copy of your key, insert it and follow the instructions. Repeat the process with each key until you’re done. If you like, you can opt to protect your scan further by saving your fingerprint. This provides an extra layer of security, but also could be a lifesaver if you happen to get locked out without your wallet. If you link your credit card with the KeyMe app, save a key with your fingerprint and voila! Your finger becomes your payment method. How do you retrieve your key if you’re locked out? If you’re locked out, all you need to do is locate the nearest KeyMe locksmith in a box and cut a duplicate key. Our kiosks are equipped to print most common key types in just a few seconds. You can use the KeyMe app to locate the closest kiosk and cut a replica using only your fingerprint. Duplicate car keys will need to be mail ordered, which can be done from your phone, or a kiosk. It can take up to 3 days to receive your new key. If you are in need of immediate access to your vehicle, contact KeyMe at 855-343-5776, and we’ll connect you with an automotive locksmith near you, or visit www.key.me/locksmiths to search our locksmith directory for a vetted, reliable automotive locksmith near you. To take additional precautions, share your virtual keychain with your closest friends or family members. This way if you are ever separated from your phone during a lockout, someone close to you can come to your rescue. 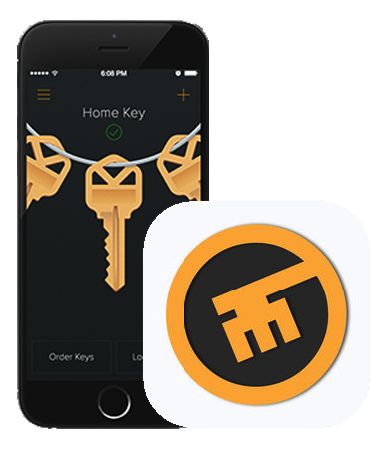 Download the KeyMe locksmith app today! Chances are at least one of them has a copy of your house key. If you are locked out before saving your keys in the KeyMe app, you can ask your loved one to upload their copy. After they do so, they can share it with you virtually, and you can print a replica at a nearby kiosk. How’s that for teamwork?! Print spare copies of your keys and keep them somewhere safe. Be even more proactive about preventing lockouts. Use the KeyMe kiosk to print extra copies of each of your keys and hide them in a safe space. Give a spare to a close friend, leave one at your parent’s house, or leave a set in your office. In the event of a lockout, you’ll feel more comfortable knowing that you’ve got a spare key in a safe place. At KeyMe we’re determined to make lockouts a thing of the past, or at the very least, make them easy to solve! We now feature an extensive database of vetted, local locksmiths. If you’re in need of a locksmith, visit www.key.me/locksmiths to browse local listings or call KeyMe at 855-343-5776, and we’ll help you find the perfect locksmith for the job.